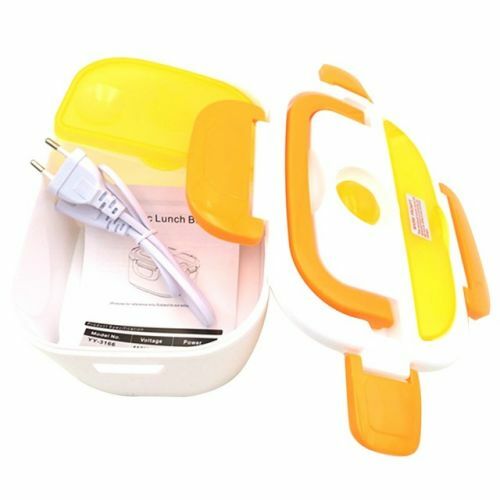 Electric Heating Lunch Box Case with Handle is a stylish, convenient and healthy way to enjoy your meals on the go. No more fast food lunches and microwaving your meals. Plug in an outlet and warm up your food right at your desk and enjoy. This Lunch Boxes was made of food grade qualified material, no toxic chemicals, lead free, PVC free, BPA free. 100% safe for your health ! It's really simple! Firstly, make sure the power adapter port is closed with the included attachable seal to prevent liquids from entering. Then just rinse the inside compartments and wipe excess foods off with a cleaning sponge. It can not be placed in microwave and oven for heating. Please open the exhaust cover before heating. Do not place the lunch box in water.